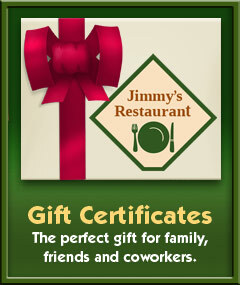 Jimmy’s Restaurant in Des Plaines serves quality home town cooking seven days a week. We are a family owned business that uses only the freshest ingredients to bring you the best dining experience in the area. At Jimmy’s, our customers love our wide variety of hearty breakfast selections including our famous crepes, skillets, pancakes and fluffy omelettes. And for lunch and dinner, Jimmy’s is proud to offer everything from great wraps and sandwiches to satisfying salads, burgers, steaks and our famous pork chops. Enjoy your meal here in our comfortable restaurant, or order from our carryout menu and take it with you! During warmer months, Jimmy’s offers outdoor seating on the patio. And don’t forget to unwind in Jimmy’s spacious bar area where you can enjoy food, drink specials, music and sports. Need food for a gathering of friends, or a party, picnic, or special event? Check out our catering menu. 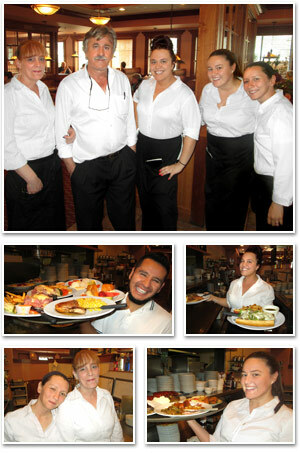 Jimmy's restaurant offers catering year round, with delicious entrees, side dishes, salads and desserts. The perfect gift for family, friends, and coworkers — available at our restaurant. Don't forget to ask about gift certificates on your next visit!